Snowpiercer, translated from a 1980s French graphic novel called Le Transperceneige, takes place in a post-apocalyptic future wherein all life on Earth has been extinguished – frozen solid as an unfortunate side effect of an airborne chemical intended to control global warming by lowering atmospheric temperatures worldwide. This technology gets away from us, as it is invariably wont to do, and the tiny, fractured human population which remains is contained within the moving prison called Snowpiercer: a massive train whose track encircles the globe, powered by its own nonstop momentum. A strict societal order is imposed upon the train’s inhabitants, restricting the lower working castes to the crowded, filthy, windowless rear cars, where they can only dream of the fabulous and opulent lifestyles that exist nearer the front. The film’s protagonist (played by a bearded Chris Evans, looking oddly Just-For-Men) leads the tail section in a rebellion when the guards arrive to deliver food, and they aim to fight their way through the train, all the way to the engine, where the train’s creator Wilford is said to live. If it sounds like a noisy, uncertain, colourful, daring, and excessively violent film, it’s because that’s exactly what it is. It’s an engaging SF premise, to be sure, but the film suffers from frequent lapses in execution. This is South Korean director Bong Joon-Ho’s first English-language film, and it’s possible that some of the erratic performances are due to his unfamiliarity with Western actors (Tilda Swinton, for example, is amazingly overplayed as the train’s “Minister”). His resume, while containing exceptionally strong entries like the criminal thriller Memories of Murder (2003) and the cult horror favourite The Host (2006), does seem to point to an inconsistency of style – even his Wikipedia entry notes his tendency towards “sudden mood shifts” and “[moving] beyond genre’s usual boundaries”. (The De Niro to his Scorsese seems to be Song Kang-Ho, who appears in all of the aforementioned films (as well as the genre-bending The Good, The Bad, The Weird), and who here plays an engineer who agrees to participate in Chris Evans’ revolution by helping to unlock the car doors as they progress forward, in return for a steady supply of a drug made from the train’s chemical waste.) It’s difficult to judge whether the movie’s jarring shifts in tempo and tone are just missteps, or part of a cultural disconnect; is this bad filmmaking, or is it simply Korean filmmaking? There are enough nods to Western styles of shot composition, scene construction, and choreography – not to mention the majority of the cast are American or British – but some stylistic choices are so outlandish it’s hard to contextualize them as such (could a movie made in Hollywood justify a 10-minute fight sequence between a collection of starving revolters and an army of axe-wielding, body-armoured ninjas?). I can’t tell whether these elements are truly strange or just intended for an audience with a different attention span, or a different sense of propriety. That said, with all the Western elements of the film you’d think it was being aimed at Western audiences, and speaking from that perspective, these elements mix poorly with the more Eastern touches. The film’s tenuous reality rests on a foundation of complex and delicate thematic material, which deserves more attention and detail than Snowpiercer can afford. The film has been described as “Bioshock on a train,” and this is a very canny comparison. Bioshock changed the landscape of storytelling in video games when it debuted in 2007, presenting players with an incredibly rich and evocative setting: a crumbling underwater Art Deco dystopia called Rapture. Bioshock also weaved sociopolitical commentary into its narrative in a way no other game had, combining the Objectivist philosphy of Ayn Rand with a stylized postwar aesthetic and the same class-based themes as Snowpiercer. The graphic novel upon which the film is based obviously came into existence long before Bioshock, but the film borrows almost more of its style and execution from the game than from its own source material. The scene in which the revolutionaries infiltrate the train’s school car and witness the true scope of the information control imposed by Wilford’s government is powerfully reminiscent of Bioshock’s classist propaganda (The Snowpiercer’s children are warned against fraternization with the lower castes just as Rapture’s citizens are warned against becoming or befriending the altruistic “parasite”). 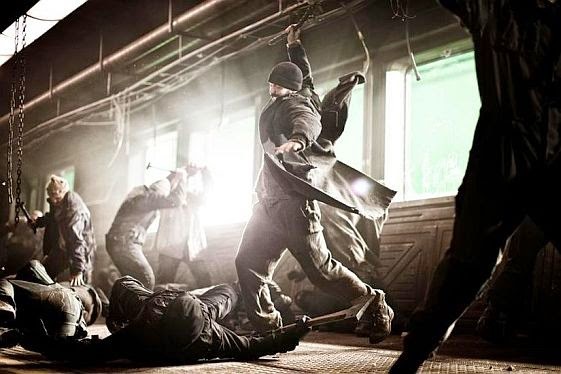 Snowpiercer’s delivery of these themes is both heavy-handed and underdeveloped, however, and its setting achieves neither the grandeur nor the horror of Rapture. The ending was abrupt and surprising – not because of any kind of twist, but because of the lack of one. Song Kang-Ho’s character, Namgoong, exists solely to deliver one piece of plot-central information: that there is evidence that Earth’s temperature is slowly falling and that life outdoors might be possible. We see nothing of this “evidence” except an assertion from Namgoong that a snow-buried airplane he sees every year appears to have less and less snow on it every time the train passes, signifying (to him) that the Earth is warming up. (Of course we’ll put aside that the difference he notices might simply be a product of high winds, or an annual change in snowfall, or indeed his drug-fueled mania – the other characters never notice this plane, so we have no idea how reliable his account is). The film ends, however, without the typical “people have actually been living outside for decades” twist that you might expect, given this piece of information. I won’t reveal what actually happens, but suffice to say there isn’t really a twist at all, and the result is disappointingly anticlimactic. Where the movie does succeed is in the level of risk it undertakes. 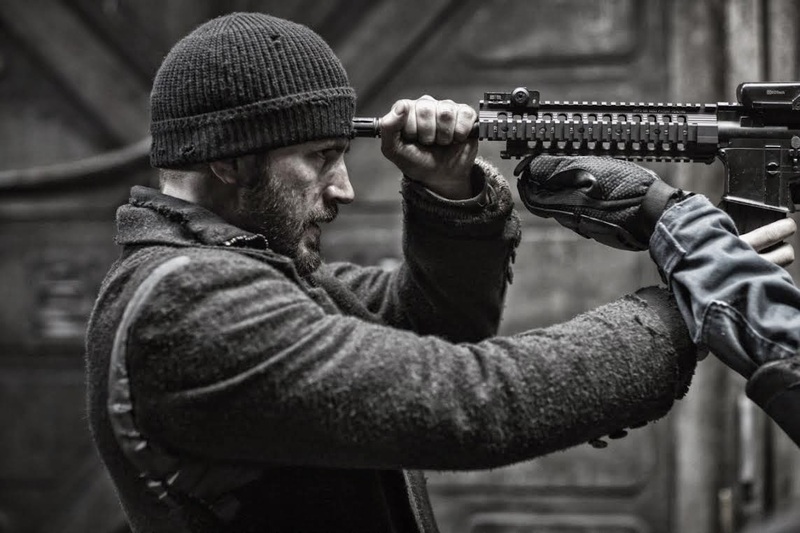 Most major studios will only bank on a “sure thing”, and Snowpiercer is anything but - which might explain the recent struggle by the director to maintain the film's original runtime for its limited North American run. It’s hard not to applaud the film for its existence alone; in this reviewer’s opinion, unusual sci-fi efforts like this are too far and few between. It's not as surefooted as Bong's other work, and it shares conventions from both Western and Asian cinema with distinct discomfort, but it's a brave, ballsy ride. I, for one, welcome any more messy missteps this director cares to make.